Steve Haddock’s research group and their collaborators study deep-sea gelatinous zooplankton (various types of jelly-like animals). Haddock’s research focuses on bioluminescence, biodiversity, and ecology of deep-sea and open-ocean ctenophores, siphonophores, radiolarians, and medusae. In addition to studying the evolutionary relationships of these animals, Haddock is interested in cloning the proteins that enable these jellies to emit light or fluoresce. On this expedition, researchers will collect gelatinous organisms, emphasizing depths beyond 1,500 meters. 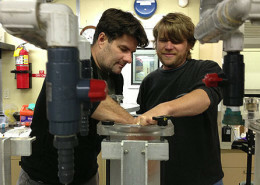 Remotely operated vehicle (ROV) dives with Doc Ricketts will be supplemented by blue water scuba diving. The vampire squid Vampyroteuthis infernalis is one of the most iconic animals in the deep sea. While there are many things that make it remarkable, the Biodiversity and Biooptics Group is interested in its ability to create light. It has several types of light organs on its body and at the tips of its arms. The vampire squid is neither a squid nor an octopus. It is the only living member of the cephalopod order Vampyromorpha which gave rise to both squids and octopuses. Vampire squids are often found in the oxygen minimum zone, an area ranging from 500 to 700 meters deep (in Monterey Bay), which is very low in dissolved oxygen and thus hosts very little life within its boundaries. The vampire squid Vampyroteuthis infernalis. Vampire squids have light organs on their body and the tips of their arms. Photo by Steve Haddock. Here you can see the auto-fluorescence from the vampire squid’s special luminous organs. The dark shadows show the suckers running along the middle of the arm. Photo by Steve Haddock. The squid Stigmatoteuthis dofleini (pictured below) was caught by ROV Doc Ricketts yesterday so we could study its fluorescence capabilities as well as its large eye, which is unique to this family of squids. It has one normal-sized eye, and one extraordinarily large eye, which is brightly fluorescent due to a blue-absorbing fluorescent pigment. The fluorescent pigment most likely aids in capturing prey by helping the squid see past its prey’s camouflage. Many organisms have fluorescent structures, but we are still exploring what the natural functions of these fluorescent pigments are. Stigmatoteuthis dofleini has one normal-sized eye, and one extraordinarily large eye, which was brightly fluorescent, indicating the presence of a blue-absorbing fluorescent pigment. The squid is illuminated under blue light and viewed through a filter. The squid’s head is in the upper half of the image. The red light shows the fluorescence of the photophores, or light organs, while green is the fluorescence of the lens of the large eye. In this close-up photo taken in the lab by Haddock, you can see the squid’s large eye and its mouth in the center of the arms. 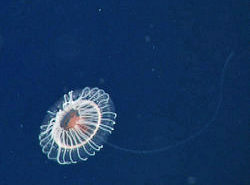 Steve Haddock and his collaborators study deep-sea jellies because the many remarkable shapes, sizes, colors, and bioluminescence capabilities can help in understanding evolution in the deep sea, the chemical processes involved in bioluminescence, predator-prey interactions, and biodiversity in the deep midwater. This undescribed physonect, called the galaxy siphonophore by Haddock and his collaborators, is one of the more spectacular of the deep-living species observed this week. It is often found in this spiral shape, casting its many tentacles all around like a spider in its web. This Solmissus jelly is probably its deep purple color because of it’s prey—in this case, another purple jelly! This undescribed species of hydromedusa Tetrorchis shows pink pigmentation due to absorbance, and rainbow iridescence due to the thin-film effect of its tissue acting on white incident light from the ROV. Today we were treated to a rare sighting of a barreleye fish, Macropinna microstoma. It has only been observed with our remotely operated vehicles six times in 27 years! Most of the time, the fish hangs motionless in the water, with its body in a horizontal position and its eyes looking upward. The green pigments in its eyes may filter out sunlight coming directly from the sea surface, helping the barreleye spot the bioluminescent glow of jellies or other animals directly overhead. When it spots prey (such as a drifting jelly), the fish rotates its eyes forward and swims upward, in feeding mode. 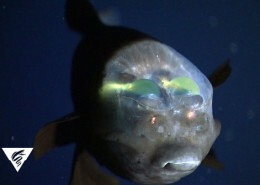 Researchers aboard the Western Flyer observed a barreleye fish, Macropinna microstoma. The feet in the video below are those of a black-footed albatross, Phoebastria nigripes. It is a large seabird whose range at sea varies during the seasons. They are found throughout vast areas of the North Pacific, feeding from Alaska to California and even Japan. This video was shot by scuba diver Steve Haddock, whose team is conducting research on the Western Flyer. Today they were offshore of Big Sur.